Despite originally being expected in late June, NIS America has just announced that Cave Story 3D will be hitting stores in North America on August 9th, with a European release expected in September. You can check out the press release below for more details. NIS America is proud to announce today the official release date for the highly anticipated Cave Story 3D for the Nintendo 3DSTM console in North America! The European release will follow a month after in September, 2011! “This game is inspiring. It’s been a while since I played a game where I keep craving for more. 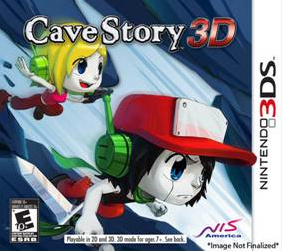 Cave Story 3D has a mysterious charm, you will want to explore more and see what lurks deep inside the dungeon. Just be prepared, this game will refuel your passion towards video games once more” says Jack Niida, Producer of NIS America, Inc.
“We’re very excited to bring Cave Story to the Nintendo 3DS. Making the transition from 2D to 3D has been a challenge, but it has allowed us to further expand the Cave Story universe envisioned by Daisuke Amaya. I think fans will have a great time with the expanded world and characters brought to life in 3D” says Victor Rodriguez CEO/Executive Producer of Nicalis, Inc.
We'll keep you posted on any new developments with the game and we'll have a full review once the game releases in August. Alright! 3rd buy of a free game locked in! Also, that box art is incredible! There are officially too many games coming out this summer for my wallet to handle. That box art looks terrible. I think, they were better off, making this game cel-shade. I'm excited about this. And I think the box art is average, not terrible and not amazing like the european LoZ:OoT box art. I think I'll buy this as soon as it's out even though I don't have a 3DS. Nothing better than a remake of a remake of a free game. And the 3DS continues to live up to it's great fame of remakes. how on earth can you make Curly ugly, I mean srsly! @AlexSays: Yeah, yeah, we get it. You've said the same thing on every other comment thread about a remake game. Thank God. This give my wallet some time to recover! A remake. I love remakes. Please make more. I like seeing people annoyed for petty reasons. Srsly, like what happened to this gal? This new art looks... ugh. No likey. "We'll keep you posted on any new developments with the game and we'll have a full review for you when the game releases in August." When it releases in August? 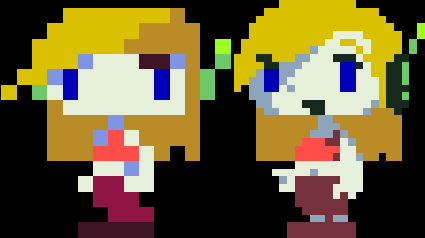 This is Cave Story we're talking about here. Surely there will be at least one delay. ^ He means August 2013, d'oh. Would I like to have Cave Story 2? Very much so. Am I happy to have a definitive, retail version of this game? Very much so. It could just be me, but I would rather have more games than my wallet can handle, then sitting around waiting for somthing id really like to play to come aorund. Of course I trade in games to get new ones also. wait now it's a 40 dollar full retail title..? I really don't care about the price. I've skipped getting it twice, so I think third time the charm. I do neither know from when those wip screenshots are (IGN posted them yesterday), nor how far the game has progressed from there. Now, if these were pre-alpha shots of a running prototype, that might be ok, because although they look hideous now, that would mean they had enough room for improvement. The trouble is the release date. I don't think there is even room to argue, that this is not actually what we would expect from a full price remake of Cave Story. It's also not even near what their concept art of the levels looks like in terms of atmosphere. At this point, I'm not completely faithful, that Nicalis can turn this into a quality remake before the release, even with the delay. Here is hoping they don't this up. But with the release rather close and their track record of taking ages for bringing Cave Story to WiiWare (and even that was bugged), I'm doubtful at the very best. Unless they push this to the end of the year or possibly beyond, we're probably in for a massive disappointment. Will i cave in to it ? I don't really know yet. The normal price i pay for graphical remakes is 15 € so i don't think i'll invest much more on this game. PS: It would be interesting to know if this release contains a version with the original PC or DSiWare graphics and sound too. Meh. Retro graphics suit this game better, I think the 3ds visuals look square-ish. The environments looks okay but the character models look pretty bad. LOL, yeah remakes are fun and it's funny how much it annoys people (looking at you Alexsays). Anything that gets even MORE to notice a great game is fine by me. It sure beats having "Petz this version" and "Imagine that version"
so many games coming out, my wallet will not like it. my wife neither. i will need to make a list and buy the titles now and then... but why making them 40- 45$ ?????? make them 30-35 and ill buy 2 instead of 1 ! The boxart is HILARIOUSLY BAD. That doesn't matter to me though, one of my favorite games ib eing released and it's published by one of my favorite publishers! secret Disgaea character boss fight, anyone? Maybe the box art is "bringing us back to the past" when all the NES boxes had terrible covers? Anyways, I can't wait for this! Why would it annoy me that you like playing the same games over and over and over? I couldn't care less. I have other gaming devices that I use much more frequently than anything Nintendo because they're regularly supported by NEW games. And I don't even have time for those! Heck, if you Nintendo guys ever get a new game that is actually decent, I'll have even less time! I'm really not digging the boxart. Its too anime-ish, and doesn't seem to do the original characters justice. And I don't know how in the world they can justify paying $40 if the only updates are the graphics, sound, and a slight expansion of the world. While it is indeed a great game, it only lasted about 8 hours for me on my first playthrough, and there's NO WAY you can justify $40 with only 8 hours of gameplay. Actually, this already is a delay, isn't it? Box art is meh, hope it doesn't represent the graphical quality of the rest of the game. Much more excited about SAGA for obvious reasons, but this still has the potential to be amazing as well. 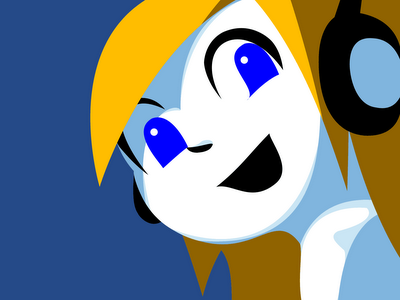 ohh yeah ....cave story..bring it all back!